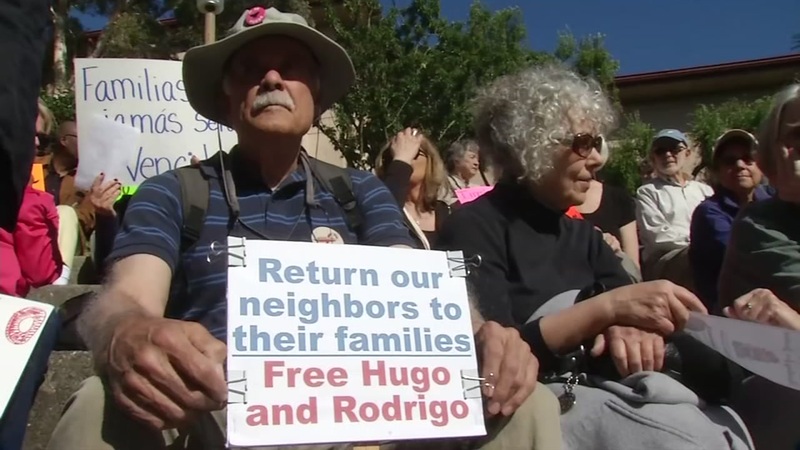 SAN RAFAEL, Calif. -- A rally was held Sunday outside the Yuba County Jail to demand the release of a Bay Area man being held by U.S. Immigration and Customs Enforcement officials, immigrant advocates said. The rally started at about 1 p.m. at 215 Fifth St. in Marysville where 30 to 50 people will demand the release of Rodrigo Nunez, a Hayward man with a wife and three children. Nunez has lived in the U.S. for more than 15 years, officials with the California Immigrant Policy Center said. When immigration agents detained him on May 3 he was working as a construction worker on a hospital on Travis Air Force Base. Executive director of Services, Immigrant Rights and Education Network Maricela Gutierrez said Nunez has been contributing to society, paying taxes and supporting his family and therefore should not be deported. SIREN also is an immigrant advocacy group. Immigration agents detained another man with Nunez. San Rafael resident Hugo Mejia is being held at the Rio Cosumnes Correctional Center in Sacramento County. Mejia is married with three children and like Nunez has been paying taxes, supporting his family and contributing to society. Neither man has a criminal record, Gutierrez said. Neither is a citizen. "We are demanding the immediate release of both men," she said. Nunez's family attended the rally and was going to visit with him afterwards. Gutierrez said we're in a time with a broken immigration system and there is no path to citizenship for people like Nunez and Mejia. Both men were deported once before in 2001. Immigration officials are trying to use a 16-year-old deportation order issued by an immigration agent, and not a judge, to deport the two, according to officials with the California Immigrant Policy Center. The officials said neither man has had a hearing before an immigration judge. Anyone wanting to show support for the release of the men can call immigration officials at (415) 844-5503.